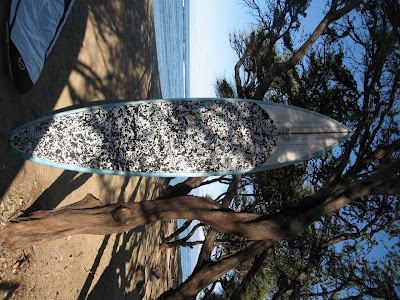 Stand Up Paddle Surfing: Fresh from Maui: Maui Bob's Finished Board- sick! 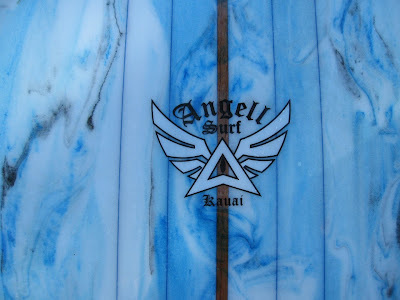 A while back I posted a submitted photo of a stand up board being made by Kauai shaper Mark Angel for a guy I call Maui Bob. 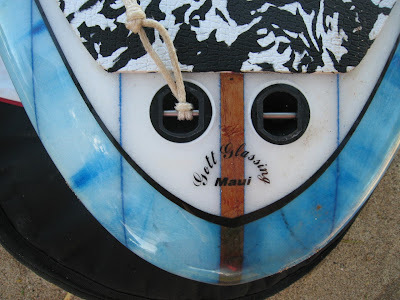 Maui Bob is a cool guy- every so often he'll send me a cryptic message about what's happening on Maui and usually, if I'm lucky, he'll send some photos of cool stuff from the islands. We all love to see what's happening out there because, basically, designs pioneered out there usually filter down to our beaches. And, the water is so much heavier out there that it's cool to see what the really gnarly stand up guys are doing. Well, today we really scored in the photo department. 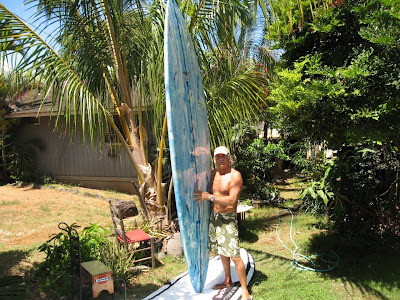 Check out the finished stand up board that Maui Bob ordered. Drop dead beautiful. But beautiful in a scary way because if you check the lines on that board (and the double leash plug) you'll come to the quick conclusion that it wasn't meant for putzing around at the Dog Patch. 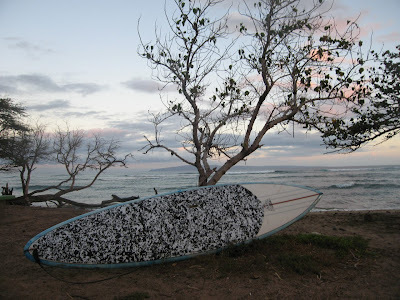 No, that board was made for something much more meaty- and if you walk down the beach with that stick, you better be ready to paddle it out into what it was made for. I think I'll hang out in the Dog Patch for awhile.